Metrix’s newly announced 9060-SCTS shaft calibration system pairs with the industrial condition monitoring system manufacturer’s Digital Proximity System (DPS) and associated Metrix hardware to enable custom shaft calibration in the field even when shaft material is not known. Available with full support in the UK from Ixthus Instrumentation, the 9060-SCTS (Shaft Calibrator Touch Select) is used to adjust the gap in pre-set micron level increments for calibrating proximity probe systems and thanks to the powerful DPS software, allows the user to change the configuration in the field for use with any Metrix, or major competitor, proximity probe and cable arrangement. The Metrix DPS combines the performance of a fully API 670 compliant eddy-current proximity measurement system with the flexibility of digital configurability. The field-configurable measurement system for position, radial vibration and speed is well proven where critical plant equipment such as motors, compressors, pumps and other rotating machines or piston based machines need to be closely monitored for optimal reliability. Typical systems for use with the DPS comprise a digital proximity transducer, interfacing cable and a choice of signal conditioner - available as a driver for a machinery protection system or as a transmitter with a 4-20 mA signal to a PLC/DCS or SCADA system. The 9060-SCTS is compatible with 5 to 22 mm probe tip diameters and with a special adapter plate works with reverse mount probes. For ease of use, the displacement is adjusted by twisting a gap adjustment ring and feeling for set ‘clicks’ that correspond to the required probe calibration increments. After each increment is completed the DPS software, which has probe characteristics and part number recognition built-in, is manually commanded to record the output value. An adjusting strap allows the mounting adapter to fit on shafts from 25 mm up to 300 mm diameter. 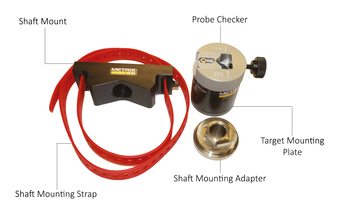 The shaft calibrator is manufactured in composite plastic material that does not affect probe sensitivity. Ixthus Instrumentationprovides complete technical and sales support for the entire range from Metrix and are on hand to advise and assist customers with standard products and customised applications. Ixthus have applied and adapted these innovative products, and many sensor components from other distribution partners, over several years in all areas of industry and research for demanding applications in military, aerospace, marine and subsea, oil and gas, mining and quarry, hoist and crane, and automotive.